One of our best sellers!! This tee will allow you to show your Mayberry Union High spirit and pride in being one of the amazing athletes who have passed through the halls. You can let others know that you were featured in Barney "Scoop" Fife's "Pickups and Splashes from Floor and Pool" sports column in the school paper. 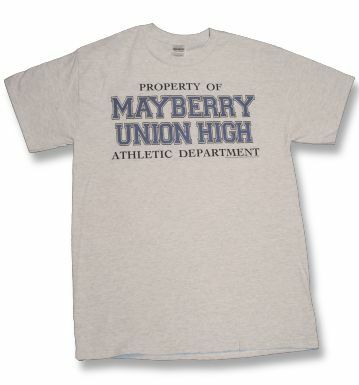 The front of the tee declares, "Property of Mayberry Union High Athletic Department" in big bold letters.